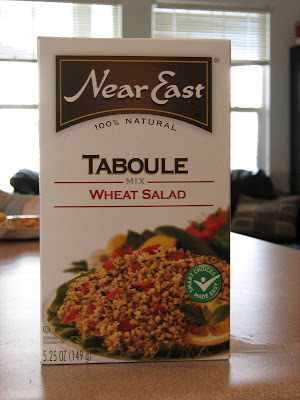 I bought this Taboule mix because I knew that is contained bulgur and just made it my own way. Brown 1 cup bulgur in 2 Tbls olive oil in a saucepan. Set aside. Saute 1 cup chopped red onion in 1 Tbls olive oil until tender. Add bulgur, seasoning packet (that comes in the box), 2 cups low sodium chicken broth, the juice of 1 lemon, 2 Tbls fresh parsley, and bring to a boil. Reduce heat to a simmer; cover and simmer for 20 minutes or until bulgur is tender and liquid is absorbed. The package of honeycomb produced alot of curiosity! What an ordeal I had to go through to get it. My sister, my mom and I were out at a Wilds Oats store trying to find some honeycomb. That store was in the process of being taken over by Whole Foods, so their inventory was changing. They called another store location that had 1 container of honeycomb left and they held it for us. Too bad when we got in the car to drive to the other location, there happened to be a blizzard. We made it eventually and then the price of that tiny container, almost made me change my mind. I don't think it was that hard to come by 2000 years ago. Our honeycomb-very sweet, as you can imagine. A tiny bite of this was really all you needed. I steamed fresh green beans, wax beans, and thin slices of carrot in the microwave and then seasoned them with salt and pepper. Preheat the broiler and move rack to the highest postion possible. Rub both sides of tilipia fillets with a little olive oil. Place on broiler rack and broil for 3 minutes. Remove from oven; turn fillets over and cover with herb mixture. Place under broiler until fish flakes with a fork, about 4-5 minutes. Season with more salt and pepper, if necessary. My kids love eating fish. Tilipia is their favorite. My 6 year old commented about this meal, "If Jesus really got to eat this, he was lucky!"